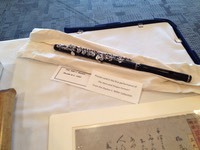 This is the piccolo in the Library of Congress flute collection that was used to play the solo in the 1897 premiere of John Philip Sousa's "Stars and Stripes Forever." Concerto Competition Winner of the Florida Symphony Youth Orchestra Jake Chabot appeared as a soloist on the May 6th, 2012 concert performing the Nielsen Concerto. Website by Bear Creative, Inc.